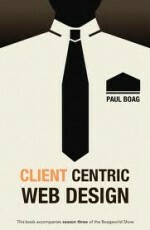 Paul Boag gives us a wonderful, straight-to-the-point ebook with Client Centric Web Design, all about web designing with the client at the center of a web project. Though other UX purists may cry heresy, I say Paul’s words have quite a bit of truth to them. Paul asks and answers why designing for the client is key to a successful project. And how to work collaboratively with the client, while saying yes to their «non-expert» suggestions. The client must be a collaborative part of any web site design. Putting the client’s business needs first insures positive communication between us and our clients. We bring web expertise to the table and our understanding of excellent UX, while the client brings objectives to the table and their understanding of what results they want. It is up to us to ensure that these objectives are well pronounced and understood. In other words the client has real value. Real expertise. We must include the client in the web design process. The key requirement is our capability to communicate consistently and with empathy. There can never be too much communication. As Paul makes clear «… a lack of communication leads to anxiety.» Anxiety is an emotion that is obviously not positive, and a good way to create clashes where there doesn’t need to be one. I’ve seen it all too often, when we do not collaborate regularly with our clients, they feel we are not doing our work. That could be with project management. That could be with understanding why we choose such a design solution. And the worst is when things move along too easily, and problems are only pointed out after the project has been delivered. Sure, we did our job, but we most likely lost our credibility in the process by not digging deeper with the client on sensitive issues. The key for me is recognizing that even when there may be difficult news to announce (not often where I work I should hope), good, informative communication puts the client in the same boat as us. It is not about saying «No, we can’t do this» for such and such reason, but instead about understanding the problem and searching for solutions together. Almost all clients are receptive to positive communication even in times of uncertainty. That is what collaboration is about. Getting the client involved, reaching out to them with all our input. Even when the client does not offer feedback, they are listening. They are appreciative of our expertise. And no doubt about it, I agree with Paul 100% when he says that «we need to make the effort to meet face-to-face or speak over the phone.» And then of course a documented follow-up by email (or using our favorite collaborative tool, as of this writing, Active Collab) should go without saying. With a phone meeting, I often prepare my email first. This gives me a sort of «ordre du jour» that I can follow while speaking to the client. Then I just include any decisions or client comments and send. Time management is essentiel in communication as with all our work efforts. I loved this ebook, because Paul has captured much of what I have been trying to do (with more or less success) at WS Interactive. I believe absolutely that user-centered design is a subset of client-centered design. I believe absolutely that when we collaborate effectively with the client everyone wins, including the user. With content, we accompany the client to help them produce well structured, optimised and readable content. As designers we dive into the content strategy, the information architecture, the call to actions, the SEO, etc, and still we struggle to get clients on the same channel. I think here as well a client-centered approach should at least help us ask the right questions. Will the client be able to manage the proposed content? How often? With what tools? Often we as designers tend to produce great images, but ones that the client may not be able to manage over the long-term. Beautiful content becomes quickly obsolete without constant intervention. Fortunately there exist other great books on helping web sites manage and create content (try Kristina Halvorson’s Content Strategy for the Web, and Erin Kissane’s The Elements of Content Strategy), though they do not necessarily look into this from a «client-centric» point of view. I would have enjoyed reading Paul’s take on that issue (though he did briefly touch on personnality). When the development process begins, the client collaboration should not end. There is much to be done with the integration. Certainly, much of the strategy is defined, the maquettes are validated, but then comes the real chore of integrating the content and building the various databases and pages. Keeping the client in the loop, with continuous iterations and communication, can save time over the long run. Weekly reports are the norm where I work, and we make an effort to have the client validate key phases before going on line. Most of the potential problems come from new types of content, or just not understanding what the client expects. Here too a client-centric approach will be critical to satisfaction.